When students walk into a music room, there is an opportunity to inspire them with a visually stimulating learning environment. This doesn’t mean filling every wall and space with dozens of posters, papers, and colors. This means creating a visual environment which acknowledges your students’ participation and input into the class. Your own teacher decorating style may be calm, clean, and efficient; perhaps something that you feel leads to less distraction. Or, you prefer inspiring educational posters and pictures of musical themes placed around your room! Sometimes we share a room, which means we can’t put up everything we want. However, it is essential to not forget student input on your walls. Often, music teachers have so much over-whelming work with the lessons and activities, that the look of the room is placed low on the priority list. There is so little time to teach music that it is easy to forget to invite your students to become contributors to the visual aspects of the music class environment. Let’s go back a minute. Why did I use ‘embracement’ in the title? Why not ‘use’ or ‘benefit?’ I felt that ‘embracement’ gives the reader the visual and emotional impact of the definition. It emphasizes the importance. The visual aspect of the music room becomes a missed opportunity if we don’t utilize its educational value and its potential to display student knowledge and musical passion. Gardner’s theory of multiple intelligences has been an academic keystone for individualizing teaching in general for generations. Howard Gardner found a way to identify student learning strengths and proposed that teachers need to adapt their lesson and adjust for this. The types of multiple intelligences include musical, kinetic, visual, and logical. Musical intelligence means we can discern aspects of sound like pitch, timbre, and rhythm. Visual Intelligence means we think in three dimensions and use our eyes while creating with our hands. All students use all the learning ‘intelligences,’ but each student is different in how his/her brain utilizes them. 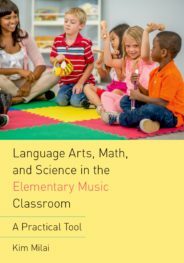 All students benefit from what they see in the music classroom, but especially the students that are strong in their visual and spatial sense. I myself am a visual learner and my music experience and understanding have been enriched by the tapestry of music notation and drawing and expression within the classroom. “Differentiated instruction” refers to a teaching philosophy that incorporates giving different students different ways to learn the same material. By differentiating your instruction, you have a better chance of reaching more students. You also have a better chance of deeper comprehension. Valerie Strauss in the 2013 article “Howard Gardner: ‘Multiple Intelligences’ are not ‘Learning Styles’” gives us sound ways to incorporate this thinking. She says, “Individualize Your Teaching.” Find different, effective strategies that work for each student. She also says, “Pluralize Your Teaching.” Write your lesson plans while keeping in mind you need to teach materials in different ways. My example of her idea is to teach a music concept using singing, clapping, reading, drawing, analyzing charts, and more. These are just a few examples. If would like to share your own ideas, I would love to hear about them in the comments section. Image credit: Hanging pictures, photo courtesy of author. Hanging Pictures (see photo): Students are given white art paper, pencils, and pastels and are asked to come up with colorful impromptu drawings of a music theme. The class discusses ideas like drawing instruments, people singing and dancing, music notation, etc. The teacher shows drawn examples of ideas. Students draw their images with pencil and then finish with pastels. The teacher will have hung clothesline around the room and will hang the pictures using clothespins. Photographs: The teacher facilitates getting pictures taken of the class during music activities and displays them on bulletin boards. Music Notation: After creating their own songs using music notation, students will make a copy using fancy giant staff paper and border it with decorations to make an elegant composition display. This could also be done on the computer. Group Displays: Students work together to create maps of song locations, make diagrams, make idea webs of music concepts, and come up with rhythm or phrasing charts. Live Performance: Students present song stories with costumes and dialogue. They conduct students singing or playing instruments for a song. Reflection: The teacher gives the students time to internally reflect after a lesson; to stop and visualize music examples. Collaboration: The teacher works with the school art teacher to do an art project with a music theme that will be displayed. Remind students of what they’ve learned. Validate how they feel about music and community. Cultivate a sense of ownership of the music class. Inspire students to create more and learn more. The educator’s embracement of student-made visuals and art in the music class is, in my view, essential. This display of music and compositional themes dresses the music room and makes the room enchanting to enter. Being surrounded by your own and other’s contributions to the class is priceless in value for the student’s head as well as for the heart. Featured image credit: Pinsel mit grüner und roter Farbe by Marco Verch. CC BY 2.0 via Flickr.